History: In 1954, the Lockheed Company's famed designer, Kelly Johnson, created a new single-seat fighter design for use in the Korean conflict by the US Air Force. He made it small and relatively light, with a massive, powerful engine -- a combination which would make it very fast and very capable as an interceptor. The first XF-104 prototype was first flown on 7 February 1954, but nearly four years of development took place before the USAF began using the aircraft. 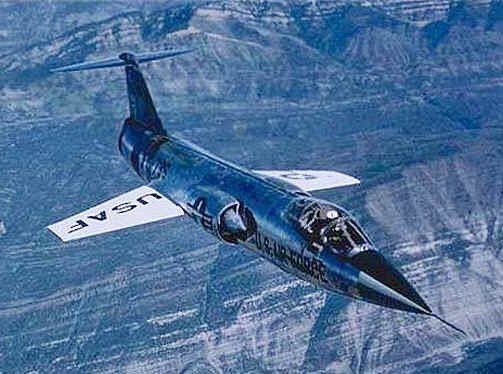 During this time the Air Force became disinterested in fighters of the F-104's class, and they purchased less than 300 of them. However, several other allied countries, under the leadership of West Germany, decided to manufacture an improved version for themselves. Production began in no fewer than six locations, including Belgium, Canada, Italy, Japan, the Netherlands and West Germany. When production ended, 2282 additional F-104s had been built by other nations. Major production variants included the F-104A (first production version); NF-104A (modified F-104A used for astronaut training; utilized maneuvering thrusters on wings and fuselage for control at high altitudes); F-104C (tactical and nuclear-strike version built for the USAF's Tactical Air Command); F-104G (major production variant built in several countries and utilizing a strengthened structure, more advanced avionics, and various aerodynamic improvements); RF-104G (tactical reconnaissance version); CF-104 (Canadian-built version of the F-104G with removable aerial refueling probe). Aeritalia later developed a multi-role version called the F-104S for the Italian and Turkish air forces. In 1985, the Italian Air Force began upgrading 150 Starfighters with modern radar, improved self-protection systems and avionics, and up-to-date weapons-delivery capability. These aircraft, designated F-104S-ASAs, are still in front-line service, and are expected to remain flying until the Eurofighter replaces them in approximately 2001. At least three F-104s are now flown by private owners in the USA, and several more are under restoration. Engine: One 15,600-lb thrust General Electric J79-GE-11A afterburning turbojet. Weight: Empty 13,990 lbs., Max Takeoff 29,030 lbs. Up to 4,000 lbs. of bombs, missiles, rockets and other stores. Number Still Airworthy: At least 3 in private ownership; Unknown number in active service worldwide. Michigan F-104 Page -- An F-104 restoration in the USA. "North American Eagle" -- Land speed record challenger, created from the fuselage of an F-104A. Norwegian F-104 Starfighter Site -- An excellent and interesting site. Ruminations on the F-104 -- A pilot's recollections of flying the -104.